Photo by Violet Noe. Rose dance students perform in the recital. On May 29, students from the Dance 1 and Dance 2 classes here at Rose showcased their talent and months of hard work as they leapt into their spring dance recital. Sophomore Angel Williams is in her second year of dance at Rose and performed in the recital this past week. 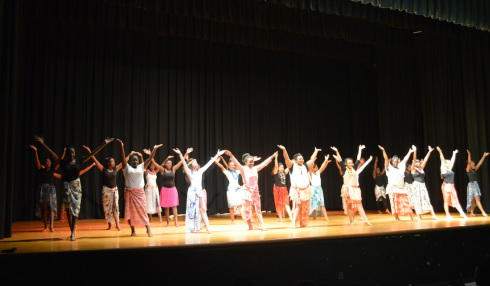 The recital featured several different types of dances, including a country dance, a movement dance, a modern dance and a hula dance. “I enjoy the fact that we can put different types of dances together and it still flows well,” Williams said. Some of the dances were choreographed by dance teacher Tara Shumaker-Nojima, while other dances were choreographed by the students. Senior Arianna Blakeslee enjoyed getting to choreograph the movement dance. Williams found that her favorite dance was the country dance. For sophomore Nubia Harris, the new experiences she faced in dance were the most rewarding. “What I like most about dance is getting to have fun, meet new people, learn new dances and learn how to do certain dance moves,” Harris said. Sophomore Jakoya Pridgen found that dance was not as challenging as it originally seemed. Although the dance students work hard in their classes, Blakeslee believes that sometimes the students do not get the credit they deserve.